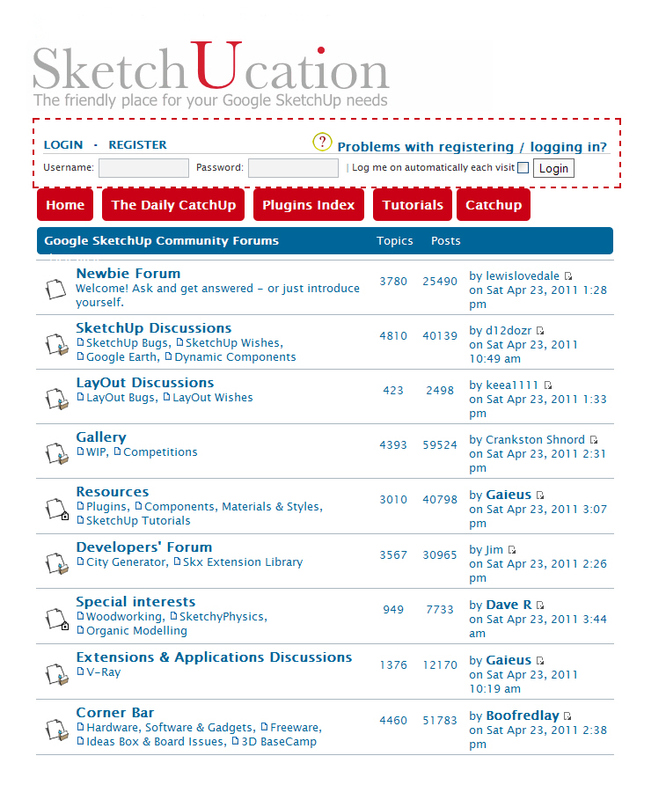 If you’re beginning to think SketchUp has some potential for construction management, you should take a look at the SketchUcation website. 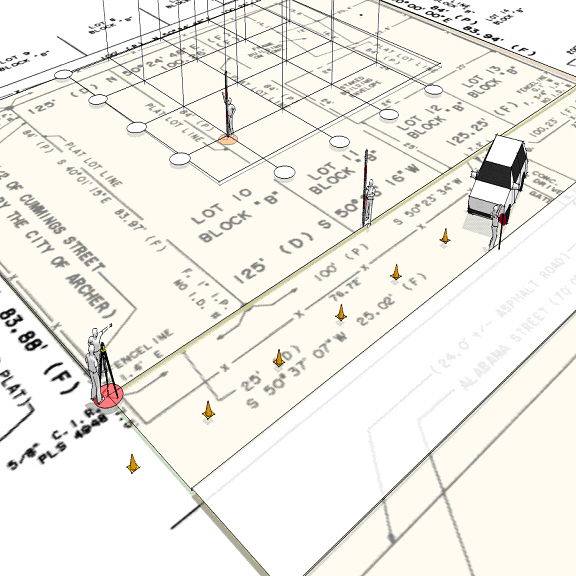 The communities surrounding the user forums on this site are at the core of the SketchUp community and one of the most important resources for construction modeling. You can click around the forums and tutorials before you join, but to search topics for help or to download components and plug-ins, you need to register to participate and post. Once inside the forums and links, you’ll find every possible SketchUp resource as well as answers to (almost) any questions you might have about SketchUp. The SketchUcation forums and content make this website an essential modeling resource. One thing that becomes almost immediately clear is that the SketchUcation website is dominated by designers, which means most of the model exchanges and discussions center around what makes the program work as a colorful and photo-realistic predesign tool. You’ll also quickly discover that design-oriented users, by Google strategy or neglect, pretty much define the modeling program. This includes a development team with limited industry experience that drives the program to become even more narrowly focused as a design tool. In other words, you won’t find a lot about process, production, or construction modeling unless you dig deep into the SketchUcation forums. 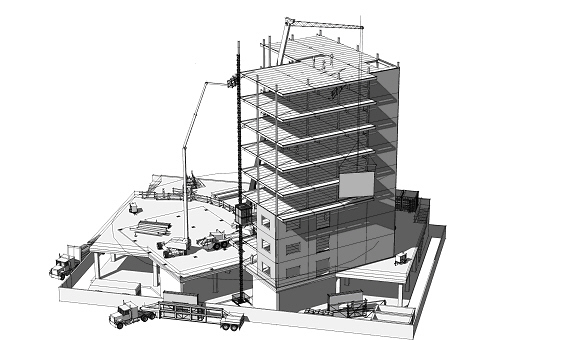 At the same time, no where is the contrast between construction and design more clearly demonstrated than on the pages of the CatchUp – SketchUcation Community News where we’ve recently started the first in a series of articles on construction modeling. An interesting thing occurred with the second issue of their online magazine. As you flip through the pages of the e-magazine, the layouts and the quality of the graphic design are really impressive. But look at the last page and the first part of a long (long) series of short tutorials on how to build a little house as a SketchUp construction model. The juxtaposition of our unembellished, black and white format and the stylistic and design oriented images in the rest of the magazine, brings the difference between construction and design modeling clearly into focus. The contrast in the look and feel of these pages illustrates the difference between design and construction modeling. Like many outside of design, only a few construction managers care about color and style, except how it might be specified in the construction documents. Instead most want to communicate intent or process and the cold hard facts associated with getting a building built. In this way, the contrast is a graphic representation of two different worlds. One uses models to introduce or sell a design product with color and imaginative style. While the other uses three-dimensional models to visually manage the materials, labor, equipment and tools necessary to produce that product. Construction models are built to communicate construction and not design. The emphasis is therefore on models that can be quickly staged, annotated, emailed, posted, exported, printed, or faxed in minutes by anyone as fast, simple explanations. The models are used to generate graphic explanations, visually simple, black and white, with the focus on process and production. This means construction models are faster to generate than design models. 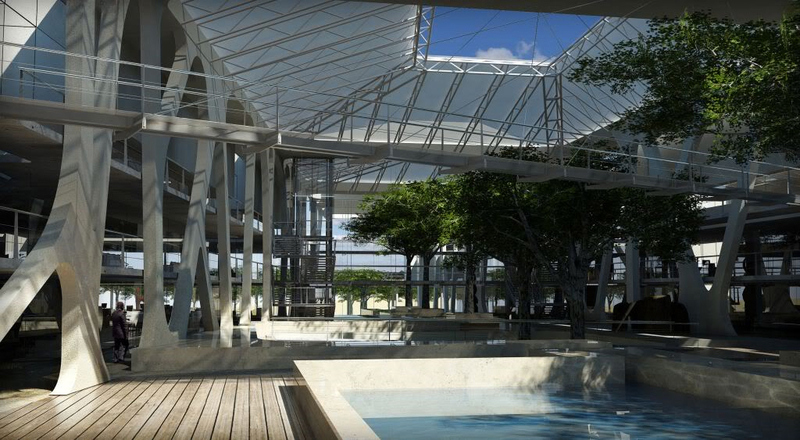 As such, they are assemblies, nested and organized by the SketchUp Outliner, and based on a library of prefabricated pieces saved from all previous constructions. 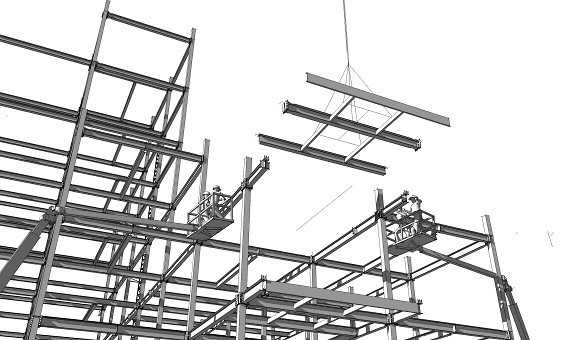 The model combines a scaled site setup and wire frames as component rigs on which to align and join previously fabricated pieces and subassemblies. When these pieces are saved from models of the same building type, almost anything can be quickly reassembled from what is basically a proprietary kit of parts. The only skill that is really required is to actually understand how the building is put together. For construction communications, the completed assembly represents the process embedded in the result. This is not a static picture of a construction. 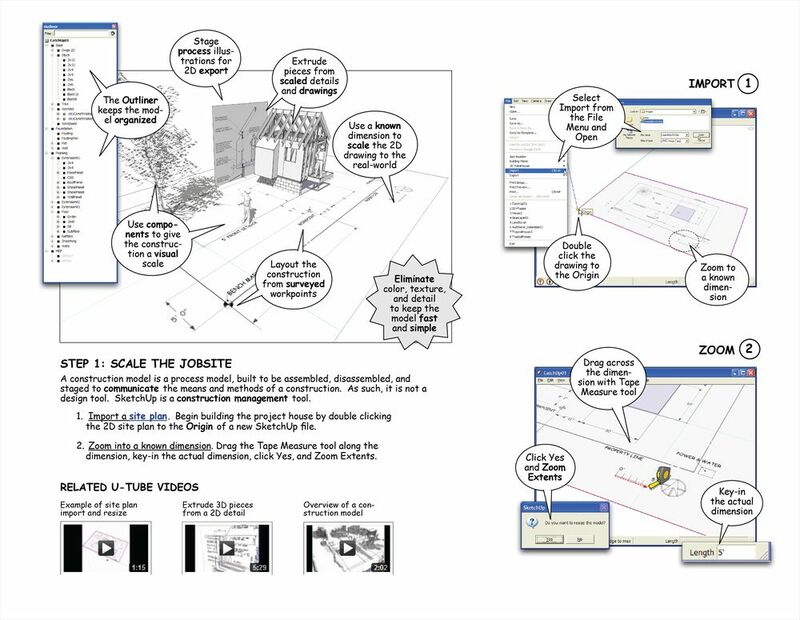 The SketchUp Outliner, layers, and scenes are therefore used to control sequence illustrations or animations in order to dynamically communicate particular details or problems, test preconstruction assumptions, and simulate activities in order to analyze specific concerns. The result looks nothing like a design model. Images extracted from the model are visual explanations, generated on-the-fly, delivered as illustrated contractual documents, representing nothing more that what is necessary to communicate a production process.